I am excited to announce that I will be hosting a seminar called "The History of Tiki and Trader Vic's" on May 9th at Trader Vic's Atlanta at 5pm. The seminar will detail the History of Tiki in Atlanta, the Trader Vic's franchise focusing on the Atlanta location, and the Mai Tai cocktail. 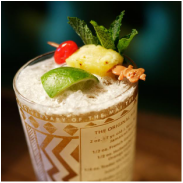 Trader Vic's signature drink! The seminar costs 20 dollars and includes a Mai Tai, and shared Tiki platter and lasts one hour.. This leaves plenty of time for tomfoolery at the bar and/or dinner. Seating is limited. Please call Trader Vic's Atlanta at (404) 221-6339 to reserve your seat. Please contact me if you have any questions. *Event date and time subject to change.